ReactIR enables scientists to measure reaction trends and profiles in real-time, providing highly specific information about kinetics, mechanism, pathways, and the influence of reaction variables on performance. Using ReactIR, directly track reactants, reagents, intermediates, products and by-products as they change during the course of the reaction. 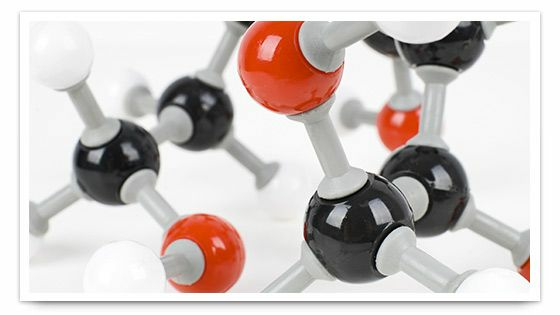 ReactIR provides critical information to scientists as they research, develop and optimize chemical compounds, synthetic routes, and chemical processes. When does the reaction start? When does the reaction stop? What are the reaction kinetics and mechanism? 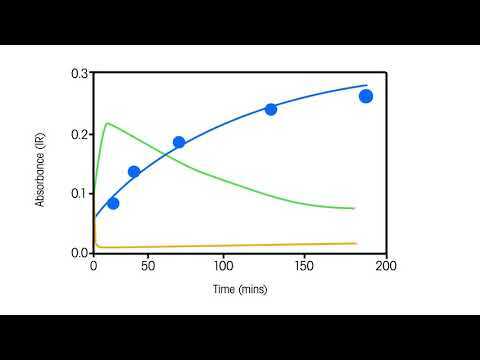 What is the effect of those transient intermediates? Did it react as expected? Did any by-products form and why? What happens if reaction temperature, dosing rates, mixing rates change? 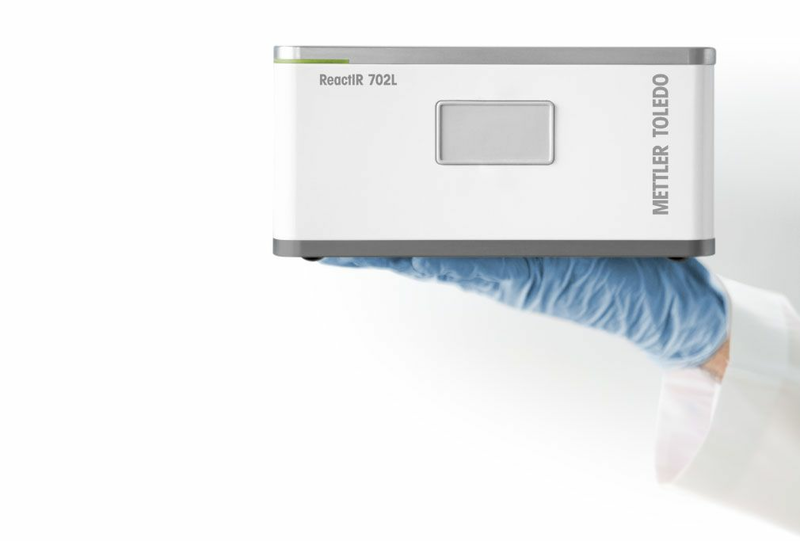 In order to get to the best data and analyze reactions quickly, there are five areas that ReactIR FTIR Spectrometer leverages so that reaction understanding is available for every chemist – expert or not. From probe to detector to software, ReactIR is optimized for use in the mid-IR “fingerprint” region – resulting in a highly-sensitive system for fast and accurate molecular information. Designed specifically for time-resolved reaction analysis, iC IR software combines a peak picking algorithm with functional group intelligence to drastically reduce analysis time. Users combine knowledge of their chemistry with an automated data analysis workflow to ensure correct collection and interpretation for every experiment. Probes designed to operate from low to high temperature, low to high pressure, under acidic, basic, caustic, oxidizing, and aqueous conditions enable the analysis of virtually any type of chemistry. 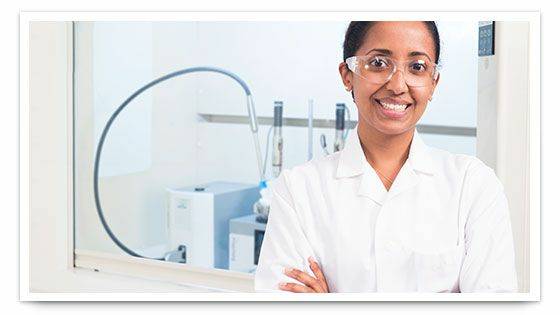 Small enough to fit in a fume hood, ATEX rated to fit in a plant, and sampling technology to sample any reaction or process - ReactIR FTIR spectrometers can be used to prove that what happens in the plant is what you observed in the lab. As a company, METTLER TOLEDO has over 30 years of dedicated reaction analysis experience. This is our focus and our passion. We built this expertise into fit-for-purpose FTIR spectrometers. Why Choose ReactIR Over Offline Analysis? Traditionally, to obtain reaction information, samples are taken for offline analysis using HPLC. 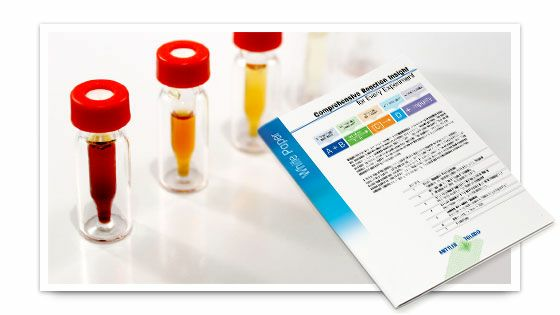 For chemistries in which sample removal results in the loss of key information, or are toxic or otherwise hazardous, this procedure is not straightforward. Furthermore, chemists must be present to take the sample and then wait for the results before reaction analysis can begin. The ReactIR 702L is the first system that truly merges the power of real-time, in situ FTIR with equivalent operational convenience. 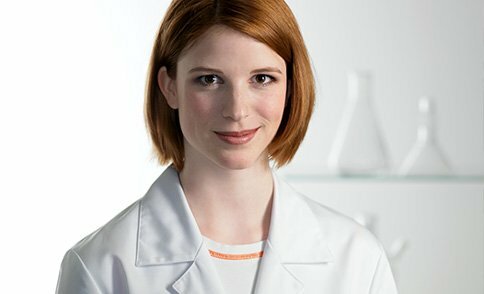 ReactIR is ready for every chemist and for every experiment. ReactIR is Ready to Run Overnight! ReactIR 702L uses solid-state cooling technology to deliver best-in-class performance - without the need for liquid nitrogen. By eliminating hazardous setup and repetitive Dewar refills, scientists can easily monitor chemistry over extended periods. ReactIR is Ready to Grab and Go! Small, stackable units save valuable space in the fume hood offers flexibility to deploy ReactIR in various locations across the lab. An “always on“ detector reduces set up time and enables scientists to start collecting data with confidence at a moment‘s notice. ReactIR is Ready for Your Chemistry! Probe- and flow-based sampling technologies enable scientists to study liquid and gas phase chemistry in batch or continuous setups. Fit-for-purpose materials of construction make data collection straightforward in acidic and corrosive environments across a wide range of temperatures and pressures. 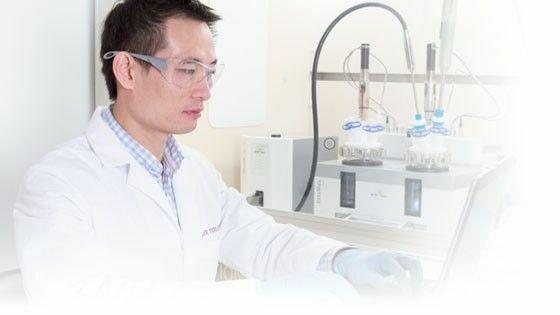 ReactIR works in a wide-range of chemistries in which the molecule is infrared active, the chemistry is in solution or off-gas, and the concentration is higher than ~0.1 %. Although ReactIR and Raman Spectrometers are often interchangeable and give complimentary information, there are practical differences that influence which one will be optimal. Most molecular symmetry will allow for both FTIR and Raman activity. In a molecule that contains a center of inversion, IR bands and Raman bands are mutually exclusive (i.e. the bond will either be Raman active or IR active but it will not be both). One general rule is that functional groups that have large changes in dipoles are strong in the IR, whereas functional groups that have weak dipole changes or have a high degree of symmetry and no net dipole change, will be better seen in Raman spectra. Need help choosing between ReactIR and Raman? What's Hiding Between Your HPLC Samples? Continuous measurements from infrared spectrometers are used for obtaining reaction profiles to calculate reaction rates. A list of publications from peer-reviewed journals focuses on exciting and novel applications of ReactIR. Researchers in both academia and industry employ in situ mid-FTIR spectrometers to provide comprehensive information and rich experimental data that to advance their research. Beutner, G., Young, I., Davies, M., Hickey, M., Park, H., Stevens, J., Ye, Q., “TCFH−NMI: Direct Access to N‑Acyl Imidazoliums for Challenging Amide Bond Formations”, Org. Lett. (2018) 20, 4218−4222. Sheikh,N., Leonori,D., Barker,G., Firth,J., Campos,K., Meijer, A., O’Brien,P., Coldham,I., “An Experimental and in Situ IR Spectroscopic Study of the Lithiation−Substitution of N-Boc-2-phenylpyrrolidine and -piperidine: Controlling the Formation of Quaternary Stereocenters” J. Am. Chem. Soc. ( 2012) 134, 5300−5308. Hamilton, P., Sanganee, M., Graham, J., Hartwig, T., Ironmonger, A., Priestley, C., Senior, L., Thompson, D., Webb, M., “Using PAT To Understand, Control, and Rapidly Scale Up the Production of a Hydrogenation Reaction and Isolation of Pharmaceutical Intermediate”, Org. Process Res. Dev. (2015) 19, 236−243. Chanda, A., Daly, A., Foley, D., LaPack, M., Mukherjee, S., Orr, J., Reid, G., Thompson, D., Ward, H., “Industry Perspectives on Process Analytical Technology: Tools and Applications in API Development”, Org. Process Res. Dev. (2015) 19, 63−83. Rehbein, M., Husmann, S., Lechner, C., Kunick, C., Scholl, S., “Fast and calibration free determination of first order reaction kinetics in API synthesis using in-situ ATR-FTIR”, European Journal of Pharmaceutics and Biopharmaceutics 126 (2018) 95–100. Study reaction progression and gain specific information about reaction initiation, conversion, intermediates and endpoint. ReactIR in situ sampling technology assures usability in a wide range of batch and continuous reaction conditions. Chemists working in chemical synthesis discover and develop innovative chemical reactions and processes.